Western Open Lands management units 3, 7, 16, 17. Western Kansas hunting gets much attention in videos and magazines. It is often overrated with expectations that are often disappointed. This presentation on Association western Kansas hunting is intended to show the best and worst of it. 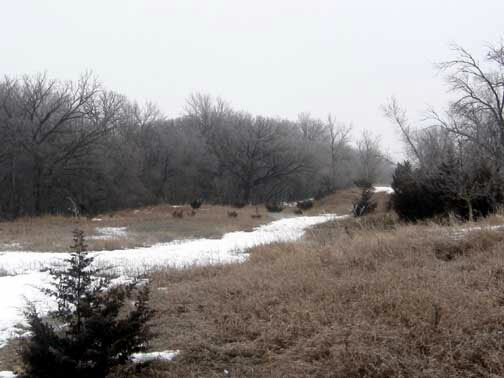 We also encourage any one thinking of a western Kansas hunt to first scout this land before applying for a tag. 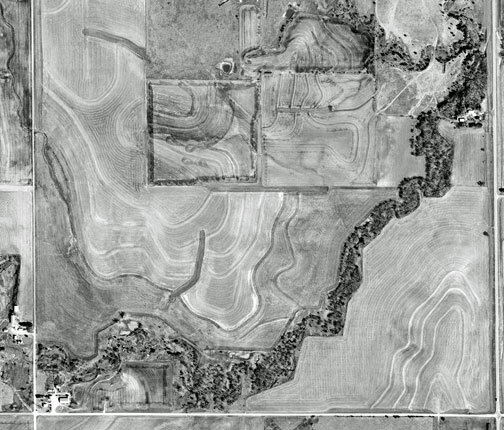 This Western Kansas hunting aerial is of the best looking habitat in western Kansas. It has yet to produce a tag-on of the biggest trophy whitetail. The largest trophies to date have been off of what is less good looking land from an aerial image perspective. It is a quarter section. 1/2 x 1/2 mile square, 160 acres. 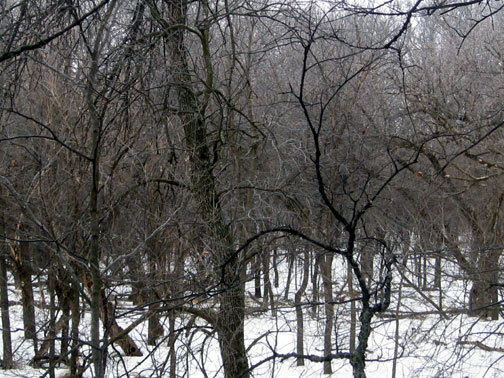 A good piece of it true to anyone’s belief of what deer cover should be, woods. This lease holds one hunter at a time. The image is from Terra Server. It shows the non-foliage time of year. Or, hunting season. Google Earth shows images from full green-up. A big difference when trying to discover movement patterns. Terra Server's more detailed images often make a difference in pre scout planning. Another interior field surrounded by wood line and earth contour isolating it from direct observation from road. Interior to the wooded drainage. All pictures can show is a bunch of trees. This habitat will most likely requires new hunting tactics. The key is the hunter himself determines his own appropriate hunting style. The ones that change techniques as does the cover and food does for each type of weather condition do the best. This shows how the statement “Too good to be true” may be appropriate. That is if we were a guide operation. 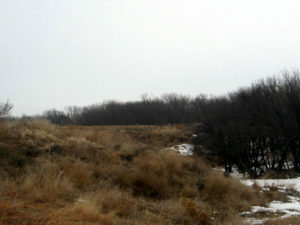 The guide would be expected to know the appropriate deer hunting style and setup for success on this terrain. Without a guide to provide direction, the hunter is left to his own resources. This often creates three basic types of hunter. Those that have immediate and continuing success. Those that get very infrequent success. Those that simply fail to harvest a buck of choice every season. It is the latter two categories that results in the non-resident hunter to have the highest turnover rate in the Association. This turnover is also not just due to the difficult terrain. It also due to the non-resident firearms hunter also being a trophy room collector. That once he has a Kansas trophy Whitetail Deer he is off on an elk, sheep or bear hunt to add that animal to his collection. Nonetheless, the difficulty of some of our habitat certainly does cause a good deal of frustration. What we do to lower that frustration is we provide recommendations of where to hunt. Our hunting recommendations are based on several factors. 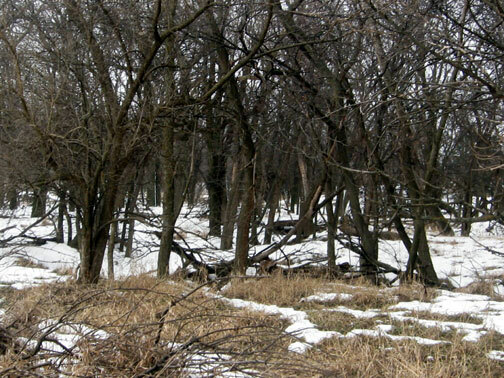 First, is the regions of Kansas that have a history of trophy deer production. The next is the hunting method of choice (archery, modern gun or muzzleloader). For the archery deer hunter Kansas can be a tough hunt. The firearms hunter has more success in western Kansas than archery hunters. This is mostly due to the longer range of observation. For the bow hunter we have more bow friendly land elsewhere. Our recommendations also include our boots on the ground experience with our lease land. That lends to a handful of trophy sightings each year. We want Association deer hunters to renew each year. We know they will most likely do so after a successful hunt. That is what the recommendations are geared to. What looks good to the eye is not always the best. The spot below is such a case. 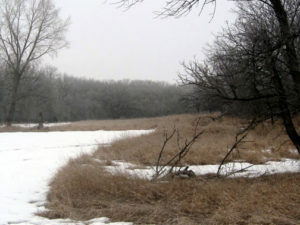 If new to central mid-west habitat there is much to be ignored. Some to be scouted. The Association does have too much hunting lease land scout it all. This aerial illustrates this point. The first year Association hunter will receive from us a farm listing of recommended starting spots. We also assist with other than first year members that are breaking into a new region. That hunter then draws down his own aerial pictures from his own favorite aerial web site. We do not provide aerial images. Hunters have their own and unique perspectives on the aerials. We will not attempt to play secretary and satisfy the various hunters. The hunter then starts a priority of first to last farm he wants to walk, glass or drive by. Then he marks those parts of the aerial that should be foot scouted. This is the time savings measure to insure the time spent on the lease is well used. No ATV scouting. The aerial illustrates for us two key terrain features that assist with narrowing down where on any farm to foot scout. That is shown on the image below. On that lease little time should be spent anywhere direct observation from the three farm yards or roads is possible. Those remaining spots are where the deer and sign will be most prevalent. In this open country deer seek to not be seen and not see humans. Land contour is the deer’s best friend. The area contained in the yellow lines can be seen from roads and farm yards. Effectively used scouting time will be first to land outside of the yellow areas. Pastures included. To further narrow down scouting spots avoid direct observation land from pastures. Most cattlemen will check cattle every day or two. That bit of human occupation is enough to modify deer patterns. Find year round water sources near or better within those isolated areas. Deer will drink every day. Having water nearby makes a more likely loafing spot. Then evaluate/predict during the hunting season what the food sources will be. A no-till grain field is better than clean till. Corn is better than soybean, milo is always good. Winter wheat is best during late season. Tall or native grass bedding areas are a bonus. 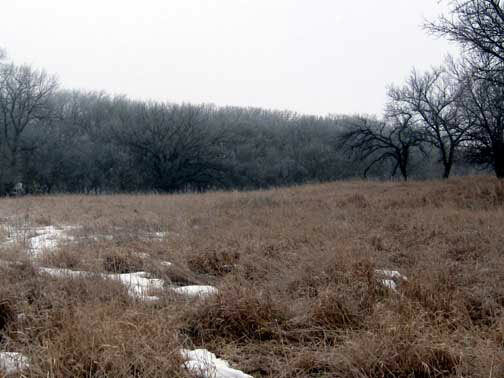 A quote from a seasoned Association bow hunter is that 30 acres of native grass beats 100 acres in timber anytime. Each hunter should come out here with more land wanting to scout than time available. It is through this process that handful of farms most wanted to hunt are the most quickly identified. Plan up a two hour minimum (more likely 4) scouting time period per 1/4 section (160 acres). Then repeat the next season covering past scouted or hunted farms and add some new ones to the knowledge bank. 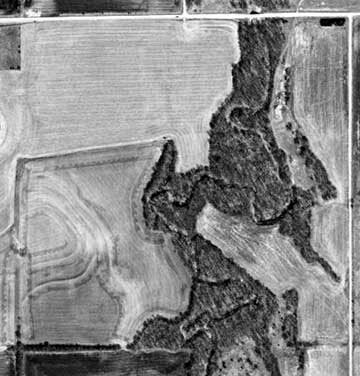 Ground images form the land in the aerials above. Inside the dry drainage, looking along the length of it. This is a typical dry Kansas drainage. What is also useful to note is that our trees grow out with branches as much as up. A lock on stand is far more useful with steps or ladder sections than a climber. The morning shrouded in fog making for dark pictures.